You know, I really am beginning to think these people, whether they be columnists or reporters, journalists, whatever... I don't think they're very educated. It's not even a question of IQ. I just... I think they stopped learning so long ago, and their education has... Knowledge has been replaced by their political ideology and events that happen are only seen pushing or hurting the political agenda. And if an event hurts the political agenda or ignore it or lie about it or recast it. If it, in their warped mind, advances their political agenda, then they run with it from the standpoint of the politics of it. And this is about Hurricane Michael. I have warned everybody that these people politicize everything, and in the process, they end up corrupting everything. And so they've got it in their heads that there's climate happening out there, that man is causing it, primarily Americans, primarily American success, American progress, primary cause, and so that's it. Once they come to that belief, then everything that they think they need to push that agenda, to make people believe it, will be reported in that way. 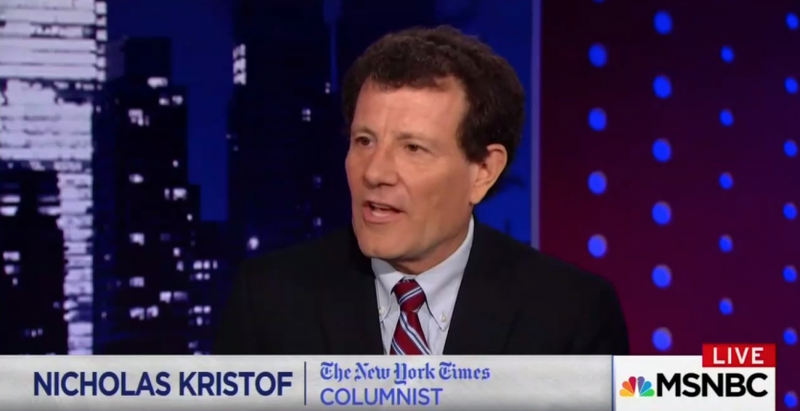 And so the headline to this Nicholas Kristof column: "The ‘Greatest Hoax’ Strikes Florida" and the subhead is, "Denying climate change doesn’t stop its devastating effects -- As Hurricane Michael rips through homes and communities, we send our sympathies to all those in its path, but let’s also review what some leading Florida residents have said about climate change." Not "about hurricanes" and not "about preparation," and not "about warnings." No, no, no! After the hurricane's gone through, let's review what some leading Florida residents have said about climate change. 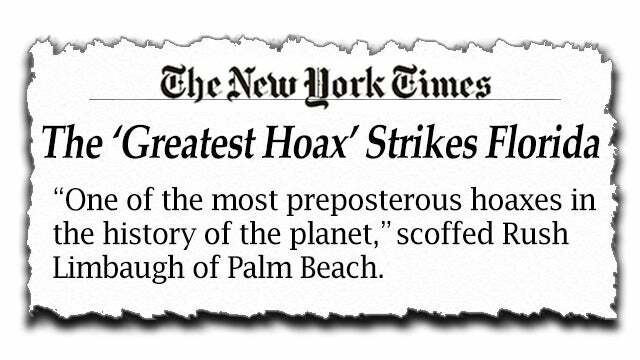 Quote: "'One of the most preposterous hoaxes in the history of the planet,' scoffed Rush Limbaugh of Palm Beach." Not "of the EIB Network," not "right-wing radio talk show host supreme." No! "Scoffed Rush Limbaugh of Palm Beach." "Gov. Rick Scott’s administration went so far as to bar some agencies from even using the term 'climate change,' according to the Florida Center for Investigative Reporting," and, of course, Scott denies this. It's absolutely absurd! It's only the Democrats that compel speech and limit speech. It's the Democrats that tell you how you have to talk and things you can't say. They're the ones that run around and say you can't call terrorism "terrorism," and they're the ones that run around claiming that everything must be attached to climate change when it is a weather event. You say, "Why? What is the purpose?" Because this promotes Big Government. It promotes the notion of gigantic, autocratic, tyrannical government control over everything. Once you, the American citizen, are blamed and can be blamed for everything that's wrong, then you can be controlled to make sure that you start doing things right and don't keep doing things wrong. That's what they want. In the process, they don't even know what they're talking about. This guy doesn't know hurricanes from thunderstorms. He doesn't know cloud tops from cloud temperatures. It doesn't matter. I want to thank Mr. Snerdley for being so sensitive and so concerned about it, but I want to assure that you these kinds of things no longer bother me, other than the fact... I do get concerned that there's so much genuine ignorance existing now in positions that influence the thinking of other people. I mean, feminist studies at universities I firmly believe has destroyed the futures of way too many women. It has just distorted life. It's distorted gender differences. It has distorted the concept of happiness, victimology. It has distorted the whole concept of America, the greatest place to live and grow up and seek opportunity in the world. And feminism is just one of many elements of liberalism that is doing the same thing to its other constituency groups.